If you think of punch as something in bowl with ginger ale, melting rainbow sherbet and fruit juice, this book will change your mind. 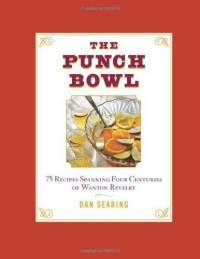 The Punch Bowl: 75 Recipes Spanning Four Centuries of Wanton Revelry aims to take you back to the glory days of punch, when it was brewed from spirits, spices and not-too-clean water. Our sanitation has improved and so has our taste, which leaves me eager to try some of these recipes. The book begins with a history of punch, which is actually more interesting than I anticipated. I don’t suppose they washed…nah. Probably not. The recipes are terrific and remind me of the classic cocktails that have come back into fashion. I love these old concoctions and recently surprised a bartender in an historic hotel by ordering a Harvey Wallbanger. Really fun. These are not the kiddy-punches you’ve served at wedding showers; they are primarily alcohol, without much in the way of mixer to lessen the impact. For example, Gothic Punch (from an 1862 bartenders guide) calls for 5 bottles of red wine, 1 bottle of champagne, 1/2 cup of sugar and 3/4 cup of orange juice. Spread Eagle Punch (you know that’s going to be a helluva party) calls for 1 bottle of single malt scotch, 1 bottle of rye, 1/2 cup of sugar, 1 cup of boiling water and some lemon zest. It’s basically one big cocktail. The Punch Bowl is an excellent choice if you’re into classic cocktails or looking to make something special for your next party. Many of the ingredients are exotic and might require an order from a specialty store, but there are plenty of punches you could try with ingredients from your local liquor store. My copy was a gift — and one I hope to get some use out of soon!